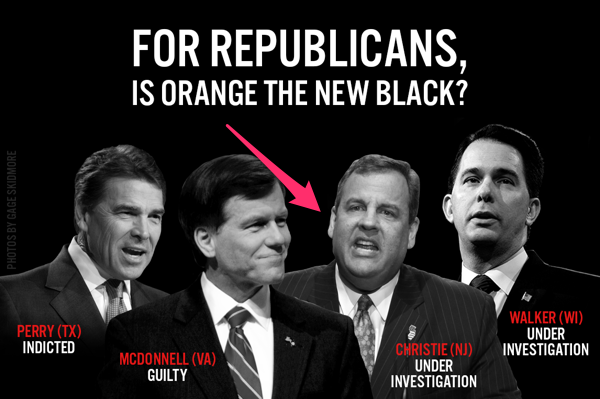 With so many convictions, indictments, and investigations concerning corruption, it’s beginning to look like orange may be the new black for the GOP. It wasn’t supposed to end this way. 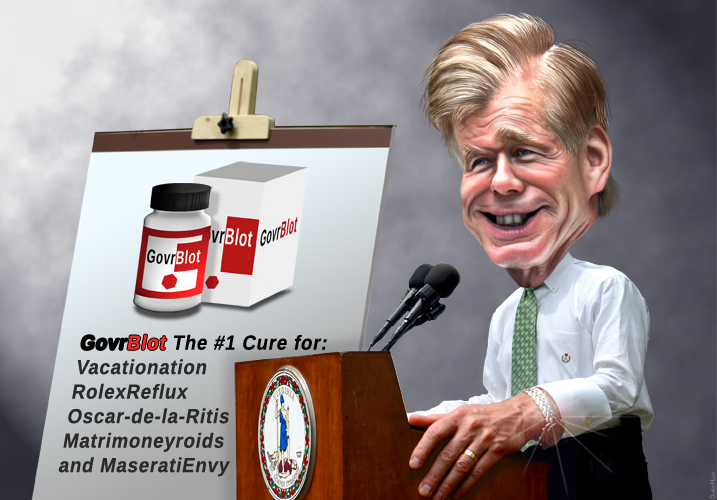 Bob McDonnell was one of the leading lights of the Republican Party. Being governor of Virginia was supposed to put him on the short list for VP in 2012, and make him a serious contender for the White House someday. That all came to an end yesterday, when both Bob and Maureen McDonnell were convicted of 11 counts of corruption, fraud, and bribery. 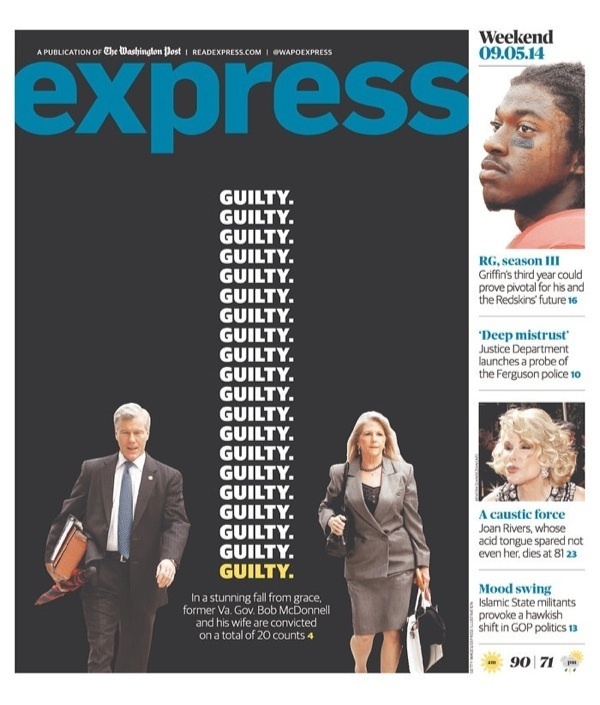 The cover of the Washington Post Express pretty much said it all. Just like that, McDonnell went from contender to outcast. The man who would be king became the political crook of our time, and all for $165,000. That’s what all the cash, golf trips, vacations, gifts and various loans modern day snake oil salesman. Just $165,000. That’s it. All McDonnell had to do was not take bribes and not engage in corruption, even if he never got anywhere near the White House, he could have earned ten times as much in cushy job lobbying for Wall Street. Worse than the corruption, is the utter stupidity of it all. McDonnell was offered deal earlier this year, if he pleaded guilty to just one count. One, any first-grader can tell you, is less than eleven. McDonnell turned down the plea deal, and instead chose to gamble on throwing his wife under the bus and painting himself as a henpecked husband. The rising star who once said, “The citizens must be certain that the governor is attending to the duties for which he was elected. The governor is Virginia’s chief executive and represents the commonwealth at all times,” and used “family values” as the basis for his college thesis, came crashing to earth. It couldn’t happen to a nicer guy. And this image that’s making the round on Facebook suggests there’s more to come. Here’s the rest of the best in Wingnuttia this week. Cenk Uygur pointed out that Phil Robertson managed to criticize Islamic extremists while sounding exactly like them. Ed Shultz pointed out that “convert or kill” is exactly what ISIS is already doing. Scott Brown became the latest Republican to declare job creation none of his business. Having failed to make repealing Obmacare the centerpiece of his campaign for New Hampshire’s senate seat, Scott Brown his made the switch to ISIS. Without a hint of irony, Fox News host Bill O’Reilly told his viewers, “When you hear something on a partisan-driven program, do not believe it!”, and warned them “Distortions are how some people make a living.” Granted he was talking about “The Daily Show,” and not his own, but the utter lack of self awareness is nonetheless impressive. Sean Hannity asked if President Obama’s “radical indoctrination” affects his decision-making on strikes used against an Islamic state. Pat Robertson used a 12-year study of American’s food choices to criticize President Obama’s “flabby and weak” foreign policy. Bryan Fisher of the American Family Association thinks Michelle Obama should launch a “Fight Obesity, Go Straight” campaign, based on a National Institutes of Health study which will reportedly examine why lesbians have a higher obesity rate than both gay men.